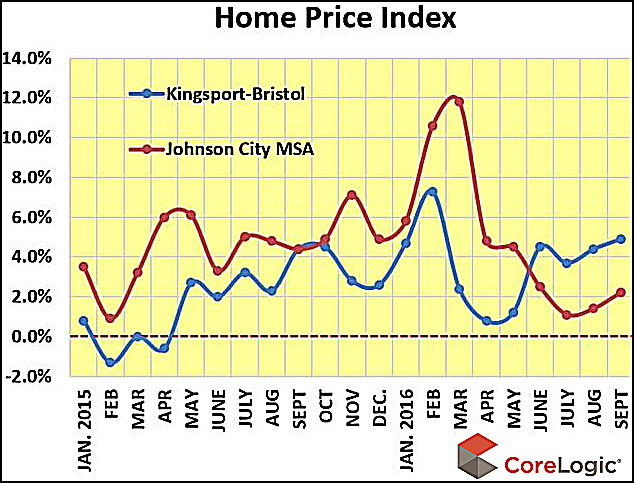 Core Logic Home Price Indexes (HPI) for both the Kingsport-Bristol and Johnson City MSAs were up again in September. It is the second month the Tri-Cities’ regions have trended in the same direction after a three-month parting of the trend paths during the peak selling season. Nationwide, home prices increased year over year by 6.3%. Kingsport-Bristol was up 4.9% while Johnson City was up 2.2%. The CoreLogic HPI Forecast indicates prices will increase 5.3% on a year-over-year basis from September 2016 to September 2017. The forecast is a projection of prices using the CoreLogic HPI and other economic variables derived from state-level forecasts by weighting indices according to the number of owner-occupied households for each state. The forecast is not available on the local level. Although the Northeast Tennessee Association of Realtors’ Trends Report does not offer home-equity data for a comparison, the year-to-date average sales price of homes in the region have improved 6.7% during the past five years while both MSA markets posted better than double that gain. During the past five years, the Johnson City MSA year-to-date average sales price reported by NETAR has increased 14.7%, and the Kingsport-Bristol average is up 13.2%. NETAR’s Trends Report uses data from single-family homes that were listed on the Regional Multiple Listing Service. CoreLogic’s HPI measures multiple market segments based on property type, price, the time between sales, loan type (conforming v. nonconforming) and distressed sales. Although the two metrics use different data sets they often show the same pattern- but not for the past two months. The Trends Report is showing an average price softening trend in both MSA. One reason for the opposing trend pattern is the effect of tight inventories in both of the Tri-Cities’ regional markets. The Johnson City MSA has felt that squeeze the most. According to the Trends Report, inventory remains tight moving into the fall and winter season while pending sales continue at a brisk pace. A dramatic increase in REO filings in the Washington County area will take some of the pressure off existing home sales when they begin hitting the market. The first could show up as early as the first of the year. According to ATTOM Data Solutions’ Q3 Foreclosure and Market Report, there were 785 new REO filings in the seven-county Northeast Tennessee region, and 336 of them were in Washington County. That total is about equal to two months of single-family resales at their current pace.